It's hard to believe the holidays are here!!! It's my absolute favorite time of year so I'm happy as a clam. When the mister and I were discussing Christmas cards, I knew we'd send some out. I just didn't know whether we'd hand write or order them. Well, I woke up one mid-December Saturday and I decided I didn't have the time to hand write-- plus, I'd really actually wanted to order all along. Enter Walgreens One Hour Pickup (and no, I'm not being compensated for this post). Not only were the prices extra affordable, we were able to create a card in the afternoon, pick them up soon after, and hand some out to family members in the evening! Best of all, our cards were a HIT! 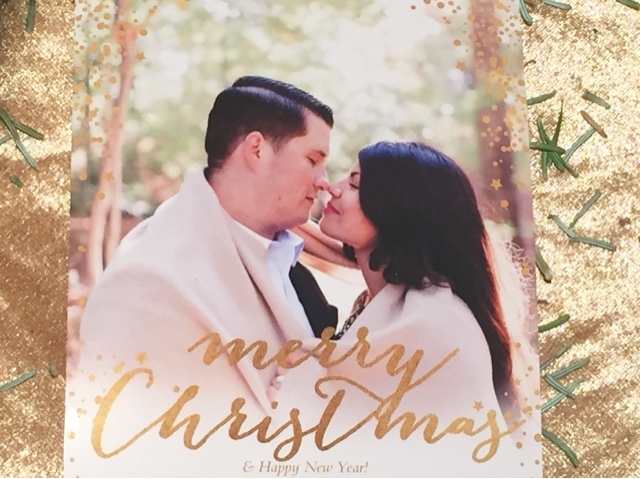 I've always enjoyed seeing families' Christmas cards and I'm really enjoying this little tradition of photo cards that we've created. Such a gorgeous card! I hope you had an amazing Christmas!